The SLE was originally founded in 1962 as part of the graduate study programme, and was called the 'Seminar für Landwirtschaftliche Entwicklung' (Centre for Agricultural Development). 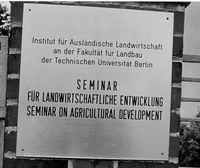 With a focus on tropical and subtropical agriculture, the SLE was initially part of the 'International Agricultural Development' department at the Technische Universität Berlin. Following the reorganisation of the three Berlin universities after German reunification in October 1992, the SLE was attached to the Faculty of Agricultural and Horticultural Sciences at the Humboldt-Universität, and in 1994 renamed the 'Seminar für Ländliche Entwicklung' (Centre for Rural Development). This new name was designed to reflect the SLE's new, broadened approach, which went beyond its initial focus on agricultural production methods. Following the faculty reform in April 2014, the SLE became part of the Faculty of Life Sciences of the Humboldt-Universität, where it continues to work today (50 years of the SLE: timeline).